2. Find the "Create New Post" button in the upper right. Click it, then select "Upload Images". 3. Select the image(s) you want to upload from your computer’s folder system. 4. 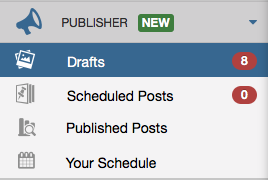 Once the upload(s) has finished, you’ll see the images added to your Drafts to edit and schedule! Images that are not an aspect ratio that Instagram allows will be cropped if you have Auto Post enabled. Read more about cropping with Tailwind in our Knowledge Base article: How can I crop or resize my Posts before they are published to Instagram?